I couldn't have been more wrong. Official recap here. The game belonged to Chris Drury and goaltender Henrik Lundqvist. Drury scored a power-play goal 1:46 into overtime, giving the New York Rangers a 2-1 victory over Pittsburgh on Monday night. Drury has scored in overtime four times and has notched 44 NHL game-winners, including seven this season. 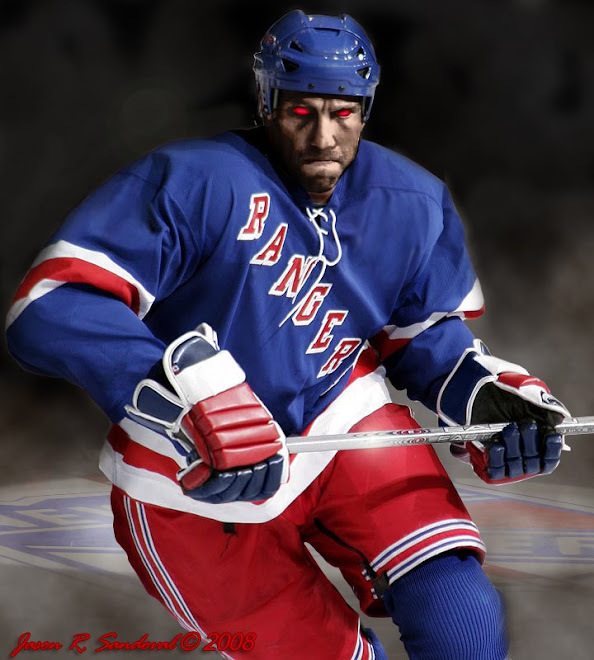 The Dark Ranger declares Chris Drury our unofficial Captain of the New York Rangers, as he is someone to build the franchise around. Many in the blogosphere criticized Dark for breaking ranks and celebrating Drury and his potential mid-way through the fall -- at the time, he wasn't scoring goals, but he was doing everything else that didn't register in the stats. He remains the ultimate playmaker and, most likely, our future "Captain of the Blueshirts" (no relation to another Rangers superhero - The Dark Ranger). "The King" was the master yesterday. It is obvious Henrik's magic is gaining momentum and hopefully he will sustain it through a successful playoff run. (crossing fingers) I am beginning to believe again, willing to go on the edge and wait. Hank...don't let me down! Our Blueshirts (41-27-11) were eliminated from the division race Sunday when they lost the opener of the home-and-home series in Pittsburgh, after last evening's victory we jumped to fifth in the Eastern Conference - one point ahead of the Ottawa Senators. We are tied in points with the fourth-place New Jersey Devils, but are behind because they have two fewer wins. This week we go to the Island to capture two more wins (optimism, folks!) and ending the regular season against our cross-Hudson rivals, The NJ Devils of Newark. We are 7-0 against NJ this season and another win would likely just piss-them-off going into a potential first-round playoff run against them. It's possible and that would make for some great hockey. Three more to go....we might actually do something right this week. Contrary to what you think, I LOVE THE NEW YORK RANGERS, maybe just not the players it's comprised of season to season. Criticism promotes discussion, and in fact, you wrote something on MY blog and remembered that I think Chris Drury is one of the more hopeful players on the roster in recent years. that game was awesome. i think its time to have some beer, re-think the team and believe they have become something different than we are used to.